Turkey, improv and witches, oh my! I hope everyone had a bountiful Thanksgiving weekend. The folks came to visit, and we had a great time. Shopping, wine, comedy clubs, wine, flying witches. A grand time. Gator went all out and made quite the spread. He tried a new recipe for the bird: Greek lemon. Turned out wonderfully. Took five hours to prepare. He should win a medal or something. 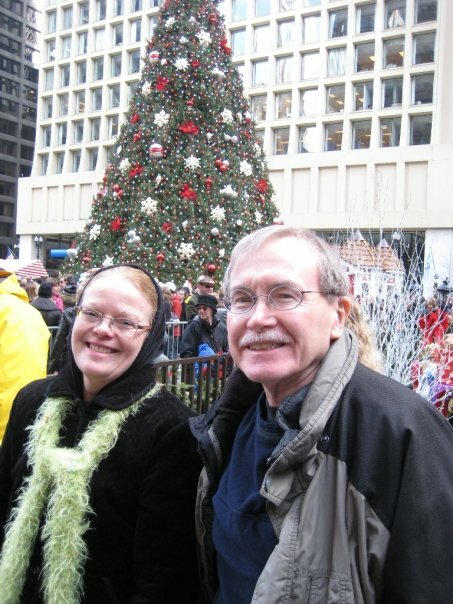 I took the parents to Second City two years ago when they visited for Thanksgiving, and they loved it then and wanted to do it again. That said, my dad’s biggest fear is to be the center of attention, especially in a comedy club. And both last time and this time, dad narrowly missed being called upon by the Second City troupe for their improv inspiration. I think he slid under the table at one point. But we escaped unscathed and with our dignity intact. Olympic Committee: What are your plans to accommodate the summer Olympic logistics? Daley: (cutting off his PR person) We have a three-prong plan. 1) To bulldoze down Lincoln Park – who’s gonna miss more yuppies with Guinness posters in their kitchen? 2) Blow up Wrigleyville and install a running track. 3) Push the South Side even further south into Indiana. Daley’s PR person: I assure you none of those are true. Except the last one. Head of Olympic Committee: So, Mayor Daley, are we to understand that Chicago will not have adequate mass transportation until 2018, is ranked one of the top murder capitals in the United States and has a long history of political corruption? What makes you think Chicago is suited for the 2016 Olympic Games? Daley: (pulling out wallet) Alright, how much money do you need? Another great skit commented on the fear of public speaking, with a class of elementary school kids getting called to recite Obama’s Grant Park acceptance speech in front of the class. Each time they would mess up, insect hands would reach from behind the curtain and pull them to their doom. Yes, I saw Wicked. This is actually my second time seeing it. The first time I went with Jamie, who got free tickets during previews over four years ago. However, the view from our seats was very limited, so I only really saw half of Wicked. From the third row, Wicked is quite an experience. Physically, it’s a very impressive show. At every moment something is moving or blinking or flying over you. As much of a theatre snob as I am, I enjoy stuff like that. But I also prefer honest acting, a good score and powerbelting. The latter was not a disappointment. Jennifer DiNoia, the standby for the regular Elphaba, was on. What a voice this woman has. She delivered the powerbelting but without excessive riffing (thankfully). Her acting was focused and grounded, if a bit ordinary. (Ana Gastyer, who I saw as Elphaba five years ago, acted the part very well, but didn’t have the voice. Combine the two, and you’d have the perfect Elphaba). I will say the first act closer is quite a sensation – especially from the third row. Annaleigh Ashford as Galina/Glinda was good. Her take on the role was vacant cheerleader with a bit too much Mary Katherine Gallagher SUPERSTAR business. Funny, but tiresome during the “emotional moments.” (I use quotes because to me they were the emotional equivalent of a Lifetime Movie co-starring Tori Spelling and Valerie Bertinelli.) However, the audience LOVED her. She won me over at the end. Yeah, I’m a sucker. The biggest surprise for me was Barbara Robertson as Madame Morrible. I’d just seen her star in Mame last month, and I was luke-warm about her there. In this, she stole the show. I agree with Chicago Tribune’s Chris Jones when he said Robertson played the role as if the director forget to tell her she wasn’t playing Medea. She was over-the-top and amazing. Thank you so much for bringing your parents to The Second City! We appreciate your support and spreading the word. Hope you have a great holiday! Awww, what a sweet report. If I ever get to Chicago, Second City will be on my list of places to visit, although I’ll be cowering under the table. I’m not big on audience participation either. And I love Wicked, so I’m glad your mom enjoyed it – and it sounds like you mostly enjoyed it this time.